The arrest of Russian national Maria Butina on allegations of being a foreign agent has put the spotlight on Bellevue's Second Amendment Foundation, its founder, Alan Gottlieb, and others in America's gun-rights community. The photo posted online in 2013 of the Bellevue-based Second Amendment Foundation’s Alan Gottlieb, wearing a pinstripe suit and his signature bow tie, might look like any random snapshot from a formal networking dinner. Except this photo was taken in Moscow. And it includes Maria Butina, a Russian national arrested this week on allegations of being an unregistered foreign agent. Butina’s arrest has put the spotlight on Gottlieb and others in America’s gun-rights community for their interactions with the Russian citizen and onetime leader of a firearms-advocacy organization. 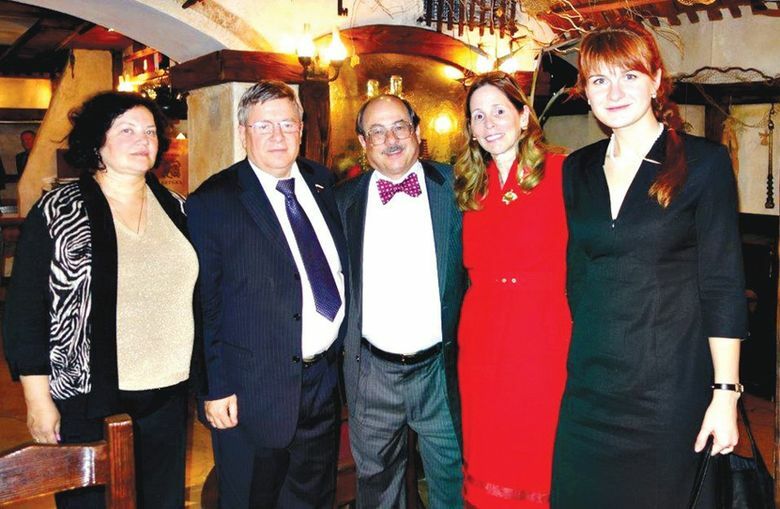 Prosecutors have accused Butina of being part of a conspiracy to infiltrate American political networks in order to report back to the Russian federation, according to news reports. That conspiracy began sometime in 2015, according to charging documents, and possibly earlier. In an interview Wednesday, Gottlieb says that while he and Butina corresponded and saw each other at conferences over a few years, her arrest caught him off-guard. Over the years, working out of his Bellevue office, Gottlieb has built a mini-empire of free-market and gun-rights advocacy. Among others, his operations include the Second Amendment Foundation (SAF), a publishing company, a direct-mail service and the Citizens Committee for the Right to Keep and Bear Arms. That work led Gottlieb about a decade ago to help form the International Association for the Protection of Civilian Arms Rights to advocate for gun rights on a global stage. Gottlieb said his path first intersected with Butina’s around 2012, as the association worked to sign up gun-rights groups in other countries as affiliate members. Butina emailed him, asking if her group, Right to Arms, could join, according to Gottlieb. A May 2012 Second Amendment Foundation blog post welcomed Right to Arms into the association. After that, “she told us she was pulling together a gun-rights conference in Moscow,” said Gottlieb. He and his wife, Julianne Versnel, who works at SAF, were invited to speak. They traveled to Moscow and took their places among over 200 Russian gun-rights activists, according to Gottlieb, and advocates from other countries at an upscale convention space. The program included speakers, rock music and models showcasing conceal-carry firearms. Gary Burris of the Lone Star Shooting Association, based in Houston, also attended the conference. In an interview, Burris said he remembered the fashion show — “fun to watch” — and recounted a shooting match that he, Butina and others attended. Another Second Amendment Foundation blog post includes video clips that show Butina introducing both Gottlieb and Burris at the conference. Gottlieb said he and Butina saw each other a few other times after Moscow, including a gun-rights conference in Taiwan where they both spoke. That last time he saw Butina, Gottlieb said, was at the National Rifle Association’s 2016 conference in Louisville, Kentucky. That conference has emerged as a focal point of possible efforts by Russians to make back-channel contact with then-presidential candidate Donald Trump, according to The New York Times. Those efforts appear to have involved Alexander Torshin, according to that report. Torshin, a Russian official who was named earlier this year in U.S. economic sanctions, appears next to Gottlieb in the 2013 photo. Butina never asked for introductions to people or other resources, and he and his wife paid their own way to Moscow, Gottlieb said. Sometime after the NRA conference, Butina told Versnel that she was too busy with academic studies to keep doing gun-rights advocacy, according to Gottlieb. She stopped responding to the international association’s emails, and someone else took her position at Right to Arms, he said. The book was a compilation of work by Russian economists who had to sneak their material out of the country by secretly faxing it from an office of Pravda, a newspaper in the then-Soviet Union, according to Gottlieb. “One day, I get the FBI knocking on my door, and they want to know why we’re getting all these faxes from Moscow,” he said. The FBI, Gottlieb said, has not questioned him about Butina or Torshin. Because of his work when Russia was still the Soviet Union, Gottlieb said it wasn’t uncommon to have advocates from that part of the world contacting him.